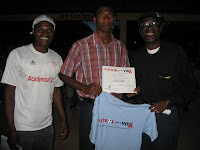 The community of La Canela, a suburb of Santiago, graduated their first group of students this month from their Futbol para la Vida HIV/AIDS prevention education program. 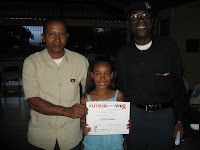 The program was built from a collaboration with the community of Batey Libertad that has grown from recent years of both men’s and women’s soccer games. 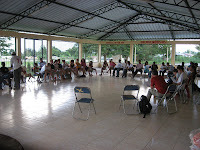 Libertad FPV trainer Yanlico recruited this first class at La Canela, ran them through 6 weeks of Friday classes, and organized a graduation and community celebration in which the visiting University of Vermont class was able to participate along with special guest Emmanuel “Manno” Sanon. 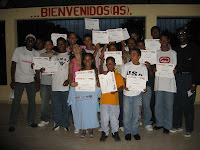 La Canela joins a growing network of communities radiating from Batey Libertad in the Cibao Valley and Saman in the Puerto Plata region that are addressing HIV/AIDS prevention among Dominican and Haitian youth through FPV programs based on the Grassroot Soccer curriculum. Below are some pictures from the graduation. Congratulations La Canela! Entry filed under: Futbol para la Vida.